A quick guide on how to compile avconv on Windows 10 x64 with everything that you will need to create .mp4 and .webm videos for the web. Inspired by my need to re-encode the Tales of the Past series into these formats and the fun of trying compiling things. Note: If you just want a binary that will work you can download the pre-compiled GPL version from the libav website. The GPL version is necessary for mp4/x264 encoding, the LGPL version does not come with this encoder. I like to use a VirtualBox VM when trying to compile various projects. It keeps my main system clean and thanks to the snapshot feature lets me easily revert back to a known state if I get things too messed up. I have a VM pre-configured with MSYS2 that I clone whenever I decide to try and compile something. Download and install MSYS2, but do not try and go through the updating steps listed on their home page just yet. As of writing this their update instructions are incorrect. There are a couple of missing steps that you need to do in order for the update to apply properly. For each of those shortcuts open their properties and change the target field to the corrected value. Finally following commands to install required packages. Download the source distributions for both x264 and libav. Extract the source files into C:\Sources. These will be accessible from within the MinGW shell at /c/Sources. As of writing this libav's most recent release (11.x) will not work with the current version of libvpx. You must instead download their latest snapshot bundle. Search for libav-snapshot.tar.bz2 in the releases directory. 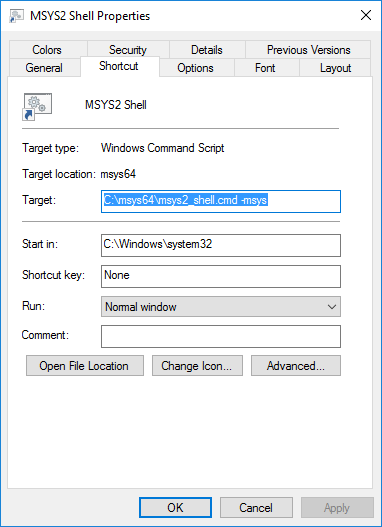 Open a MinGW Win64 Shell and navigate to the sources directory. You'll be doing all your compiling through this shell so keep it open. Navigate into the x264 source directory. Run the following command to configure the build process. Once the configuration is complete, build the project using the make command then install the binaries and headers with the make install command. Navigate into the libvpx source directory. Run the following command to configure the build process. Navigate into the libogg source directory. Run the following command to configure the build process. Open a MinGW Win64 Shell and navigate to where the libav sources reside. Now use the following command to configure the build process. Once the configuration is complete, build the project using the make command then install the binaries with the make install command. That's it, you're done! Now you can copy the binaries from C:\Compiled\bin to wherever you need them and start using avconv to encode your videos.